Read for our list of awesome Los Angeles Museums! From art to culture, space exploration, cars and fun, there is a museum for every age and taste. You cannot miss the famous Madame Tussauds Hollywood or the Ripley's Believe It or Not Museum. 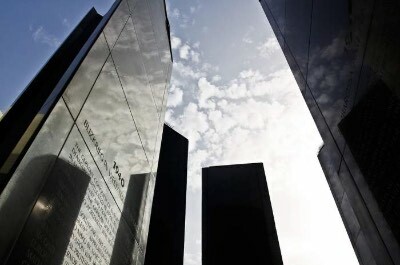 On a serious note the Los Angeles Museum of the Holocaust will sadden and inspire at the same time. Learn about old cars, Japanese American culture and the celebrities that Hollywood has made famous. A Los Angeles museum that will appeal to art lovers, architecture fans and lovers of beautiful garden is the first trip to make on your vacation. 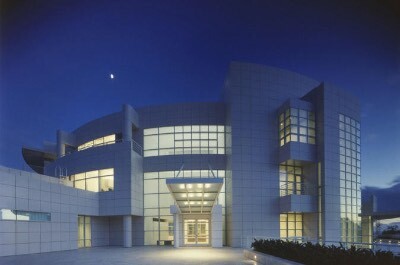 Visit the Getty Center Museum, located west of Hollywood. As you approach on the fun computer-operated tram you will be awed by the amazing design of the building by the famous Richard Meier. Explore the walkways, courtyards and fountains. Admire an art collection that ranges from Renaissance to modern day. There are five buildings filled with manuscripts, furniture, decorative arts, drawings and paintings. Art lovers will delight in Van Gogh's Irises and Rembrandt's The Abduction of Europa. For children, this Los Angeles museum offers an interactive Family Room and a special book store. After exploring the indoors, take a walk in the gardens that change every season. See the unique Cactus Garden and the panoramic views over the city and Pacific Ocean. Relax and have a bite at one of the many eateries. For a real treat, stay until the sun sets and be awed at the splendour of the fiery orange ball dipping below the horizon. 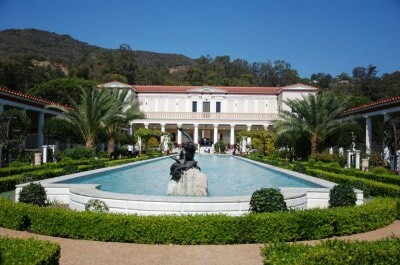 Visiting the ancient world of Rome and Greece makes a fabulous day outing at our next recommended Los Angeles museum. The Getty Villa (Malibu) has been designed as a recreation of a Roman country house in its full glory. The buildings are made from wood, bronze, glass and fossilized travertine, a grey stone brought all the way from Bagni di Tivoli, Italy, 15 miles east of Rome. The museum holds a fascinating collection of art, spanning over 7000 years from the end of the Stone Age to the fall of the Roman Empire. The venue also holds regular lectures, performances and educational and fun family events. After exploring the indoor exhibitions, take a walk in the magnificent landscaped gardens. There are tree-lined walkways that take you across streams, past waterfalls, through bougainvillea arbors and into a central plaza with a pool filled with a maze of floating azaleas. Make sure you have your camera! Located on a hilltop in the Santa Monica Mountains, this venue offers a breathtaking view of the city, ocean and mountains. Situated in the large green Griffith Park is one of the world's most famous spots for astronomy buffs, the Griffith Observatory. This awe-inspiring Los Angeles museum will astound you with all things outer-space. See the floor-to-ceiling digital image of the universe bursting with stars and galaxies. Peer through massive telescopes to observe the skies and see the world's most advanced star projector called the Big Picture. The museum also has a vast exhibition that will make you ponder on your place in the universe! Learn about the ancient concept of sun, moon and stars and the modern day space exploration programs. See photos of gas giants, planets and asteroids taken by space craft like Voyager II and the Cassini Saturn Orbiter. In the South Gallery, you will be awed by the huge ceiling mural depicting the sun with rays emanating outwards, painted by A. B. Heinsbergen. When you are done with the skies, head to the roof deck for a panoramic view of the City. This Los Angeles museum must be on your to-do list! For a fascinating family outing, head to the La Brea Tar Pits and Museum located in the heart of Los Angeles. It is an adventure that spans pre-historic dinosaurs eras to modern day fossil finds. This region is over 50000 years old and the museum showcases exhibits through the ages. See the Lake Pit which is still bubbling with natural gas. Explore the largest fossil on display, a Juniper Tree which is 14500 years old. Learn about the massive elephant-like Pleistocene that roamed around southern California and Alaska. The museum showcases ice age creatures that have been excavated and are now preserved for all to see. Kids will love the 3D theatre where they can watch the story of the Museum unfold as they encounter frozen tundra and humongous creatures like the Columbian Mammoth. This Los Angeles museum is still excavating and discovering new fossils. See the archaeologists at work as they clean, document and prepare the exhibits! Art lovers will be in heaven when you visit the Los Angeles County Museum of Art on Wilshire Boulevard. This phenomenal Los Angeles Museum holds over 150,000 works that cover the art of the world from ancient times to the present. Spend a day and explore every form of art from Asian Art to Latin American, Islamic and pre-Columbian masterpieces. The exhibition is held in a number of buildings, so be prepared to walk! They are divided into time periods, geographical regions and art genres, making it easy to understand and follow. The Museum also hosts educational programs, films, music events and family orientated days. Take one of the many tours that make it easier to absorb all that there is to see, they range from 15 to 50 minutes with a knowledgeable guide. Or, stroll around on your own and soak up the ambiance. Visit the massive library committed to research and education that offers catalogs, journals, periodicals and more. Book lovers can relax in the Reading Room and enjoy some rare and out-of-print tomes. 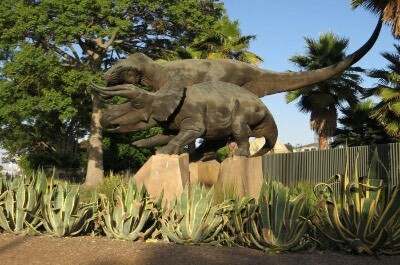 The Natural History Museum of Los Angeles County is a fabulous Los Angeles Museum for a family day outing. Discover all things natural from dinosaurs to butterflies, spiders, gems and minerals and learn how Los Angeles came to be. This vast and extensive exhibition will have you mesmerised as you wander around. Take a stroll through the beautiful Nature Gardens and then visit the Nature Lab where you can get hands on with knowledgeable scientists. Walk through the Butterfly Pavilion and see over 30 species of these magnificent fluttering creatures all around you. If you are brave, get up close and personal with creepy-crawly spiders. Kids will love the Extreme Mammals exhibition and Mum will be delighted with the sparking stones in the Gem Exhibition. When you get hungry stop for a bite at the NHMLA Grill, they serve fabulous gourmet sandwiches. Before leaving, visit the Museum Shop and buy a postcard or poster to take home as a memento. 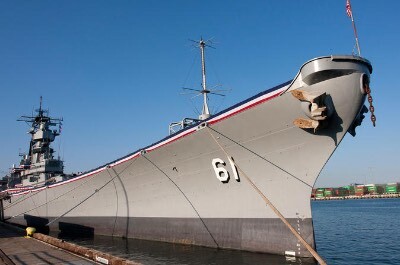 Visiting a real battle ship docked at the Waterfront is the next not-to-be-missed Los Angeles Museum attraction for the whole family. You will walk the decks of this historic ship and get a feeling of how the 1000's of sailors and 3 American Presidents lived on a day to day basis during the time period that spanned World War II and the Cold War. Take a fully interactive self-guided adventure and explore this amazing ship. Children can enjoy a scavenger hunt around the ship to find the famous mascot dog named Vicky. Learn all about maritime history, see the Tomahawk missile decks, the big guns and the navigation bridge. Walk along the wooden decks, visit the the cramped crew's living quarters, the kitchens and the lavish captain's quarters. See where President Roosevelt stayed when he planned his World War II strategy. Exploring this amazing vessel, known as the Battleship of the Presidents, is supported with films, videos, interactive displays and a cutting-edge App to make sure you get the most out of your visit. When you are done, stand on the deck and soak up the stunning scenes of the San Pedro Harbor and Long Beach. The first thing that will wow you about The Broad, our next recommended Los Angeles Museum is the amazing architecture. The outside is covered in layers of metal that have a honeycomb effect, wrapping the entire building and allowing natural light into the interior. 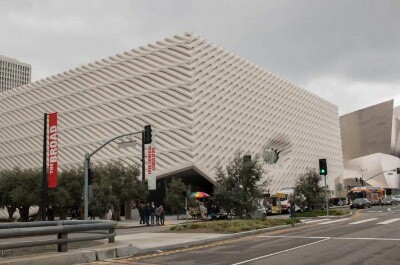 This contemporary art museum was founded by Eli and Edythe Broad and is located on Grand Avenue. It houses a permanent collection of over 2000 works of postwar and contemporary art and also features rotating temporary exhibitions that require innovative audience engagement. You can visit many times and always see something new and exciting! Stroll around and see works by Cindy Sherman, Jeff Koons and Andy Warhol. There is a mind-blowing Infinity Mirrored Room by Yayoi Kusama depicting the The Souls of Millions of Light Years Away. Don't miss the 24 foot wide canvas Beloved by Julie Mehretu. A great day outing for art lovers looking for something different. Pick up a keepsake at the shop before leaving, they have limited edition books, jewelry and fabulous gifts. No trip to Hollywood is complete without a visit to the most famous Los Angeles museum of them all - Madame Tussauds Hollywood! Located on the Hollywood Walk of Fame at the corner of Hollywood Boulevard and Highland Avenue, this Museum features wax lookalikes of famous and infamous people. There are Hollywood icons, TV stars, sports celebrities, criminals, royalty and alien characters like ET, all meticulously created in wax. Each piece takes over 100 hours to make by a team of expert sculptors. Take a tour and learn all about Madam Tussaud, who lived in the 1700's and worked as an art tutor at the Palace of Versailles. During the French Revolution, she was forced by King Louis IVX to make death masks of aristocrats that he executed. Have your photo taken with James Bond or the Queen. Become a superhero with Spiderman, Captain America, Thor or Batman. Kids will be in heaven and will never want to go home! Plan for a day of fun at this iconic venue. 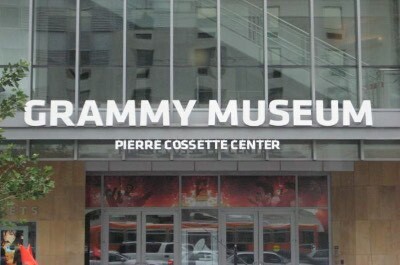 If you are interested in American music and its history, head off to the Grammy Museum. This Los Angeles museum offers a fabulous insight into the historic roots and culture of music that has existed for centuries in this country. The Museum is designed to inspire and educate using interactive displays and enticing exhibitions. Explore the world of the iconic Michael Jackson, Ella Fitzgerald and John Denver. Learn about musical instruments and the amazing history of the guitar. If you enjoy country music, make sure you see the Marty Stuart's Way Out West show, hosted by Stuart himself. Take a tour with a knowledgeable guide and see over 400 rare artifacts, choose from 25 films on view and learn how the West Coast has inspired and created music legends. After strolling around, relax and listen to a discussion about the exhibits in the Clive Davis Theater. Don't miss this fascinating Los Angeles Museum! A combination of books, art and magnificent gardens await those who enjoy the finer things in life at The Huntington. This amazing cultural, research and educational Los Angeles museum was created by Henry E Huntington, a businessman who accumulated one of the finest research libraries on the planet. His vision also extended into arts and gardens. The library holds over 6 million items, including rare books and ancient manuscripts and a world class collection of the early editions of Shakespeare's works. Nature lovers can wander around the Botanical Gardens which cover over 120 acres. 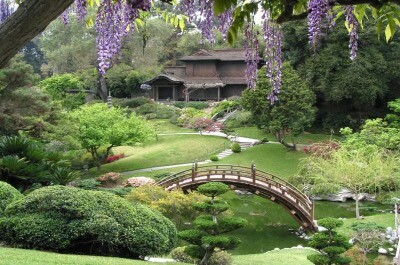 You can explore a Japanese Garden, a Rose Garden, a Desert Garden and more. There is a special Children's Garden and a Teaching Greenhouse where the family can learn about the fundamentals of botany. The art collection is held in three separate galleries. See the famous Mary Cassatt's Breakfast in Bed, Edward Hopper's The Long Leg and Frederic Edwin Church's Chimborazo. Make a day of this as you explore a world class Los Angeles Museum. 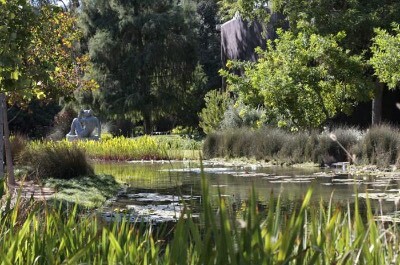 Another exclusive Los Angeles Museum created by a man with a vision is the Norton Simon Museum in Pasadena. It was originally established in 1924 to encourage the study of fine arts and exhibited 19th century American and European art, with works by Degas, Renoir, Gaugin and Daumier. The collection offers works that belong to the Impressionist and Post-Impressionist eras, works from American art and South East Asia. View sculptures from Tibet and Burma, see Chola Bronze pieces from southern India. There are also rare collections of prints, drawings and photographs. These collections are some of the finest in the world. When you need a break, take the family and visit the beautiful Sculpture Garden filled with stately trees, shrubs, colorful flowers, meandering paths and stunning sculptures that are dotted around the gardens. See the Spring Walk and the Moon Garden, be wowed at the Coral Tree and relax in the Cedar Garden. Lectures, films and art classes are also available to be enjoyed if you want to get more involved. Feel the need for speed and want to burn up the tar? A visit to our next amazing Los Angeles Museum will be the thing to do. 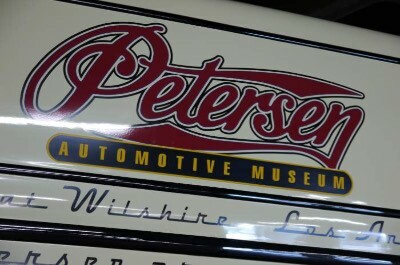 Visit the Petersen Automotive Museum for all things on wheels. The layout of the Museum features three floors, each one with a theme. Start on the History Floor and work your way up through the Industry Floor to the Artistry Floor. This will give a fabulous overview of the automobile from early times up to date. Learn about the designs behind the Jaguar and the Harley. Explore the idea of alternative power to petrol. Be awed at the art of the Bugatti and see all the famous automobiles that starred in the movies! The exhibitions also cover Italian Car Making, some of the best in the world and the Forza Motorsport Racing Experience. See old penny farthings and classic low-riding Chevrolet's. This is heaven for any car enthusiast. Don't leave without visiting the shop where you can buy a Tee, windbreaker or racing jacket to show off at home. 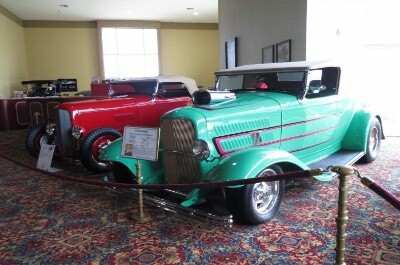 If you still want to see more beautiful creations on wheels, head to the Nethercutt Museum where you can explore a fantastic collection of rare old cars dating from the early 1900's. The collection was started by J. B. Nethercutt after he purchased and restored two old cars, a 1936 Duesenberg Convertible Roadster and a 1930 DuPont Town Car. The restoration took 18 months and cost over $65,000. In 1958, his meticulously rebuilt project claimed a prestigious award at the Pebble Beach Concours d'Elegance. Take a tour and see the 1909 Gobron-Brille, the 1911 Pope Hartford and the 1913 Mercedes Model 37/95, Double Phaeton-Torpedo. In the Grand Salon you will be awed by the marble columns, crystal chandeliers, painted ceilings and the fabulous cars with names like Duesenberg, Cadillac, Isotta-Fraschini, Maybach and more. Then head to the Mezzanine and view the collection of radiator hood ornaments, mascots and other car memorabilia. In the Music Room is a wonderful collection of old watches, grand pianos and music boxes. A perfect day outing! Just when you think you have run out of Los Angeles Museums to explore, there is more! 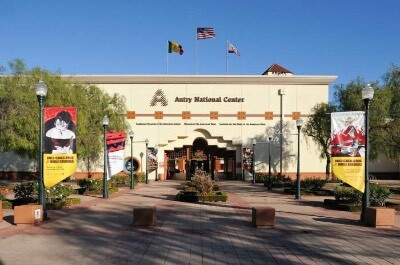 Set off to the Autry Museum of the American West to learn all about the history, culture and art of the West of America. The collections cover California History, Ranching and Cowboys, Archaeology and Anthropology, Native America and more. Learn about Theo Westenberger and the history of the Colt revolver, there is something for everyone. Kids can enjoy the Play! Exhibit with over 200 historic objects, toys and games. Learn how the residents of Standing Rock stopped the Dakota Access Pipeline. Then get hands on panning for gold, paddling down the river or learning how to weave a basket from reeds. If you are a party animal, there are Sizzling Summer Nights with music and entertainment where you can dance the night away to the sounds of Salsa and Latin fusion bands. A great all round experience for the whole family! 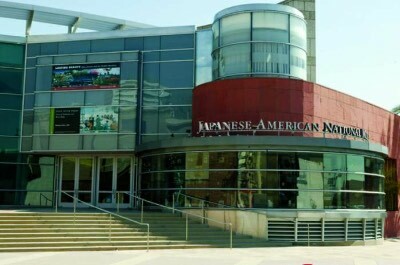 The Japanese American National Museum is dedicated to showcasing and preserving the culture and history of Japanese Americans. Head off to Little Tokyo in downtown Los Angeles to explore this exciting venue. 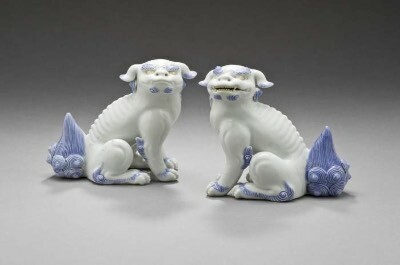 The exhibition covers over 130 years of history and has both permanent and changing shows. Movie lovers will be enthralled by the 100,000 feet of original home movies dating from the 1920's to the 1950's. Kids will love all things Hello Kitty, a modern exhibition depicting the amazing popularity of this cute cat. There are also artifacts, textiles, art and photographs to be viewed. Learn about the art of folding paper, Origami, and a little girl called Sadako who contracted leukemia after the atom bomb was dropped, she folded 1000 paper cranes in the hope that she would recover. Computer game fans will find exhibitions on iconic Japanese offerings like Brotherhood of the Game and tattoo lover will be wowed at the Perseverance Exhibition showcasing Japanese Tattoo Tradition in a Modern World. This Los Angeles Museum makes a worthwhile day outing even if you are not Japanese! Calling all photographers! 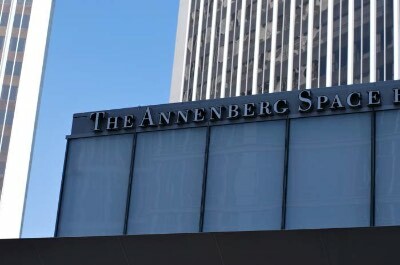 The Annenberg Space for Photography cultural center focuses on the art of photography and features fascinating rotating exhibits, lectures, workshops, master classes and family-friendly events. You will be blown away by the unique exhibitions by world famous photographers. Learn about Lauren Greenfield, an award winning documentary photographer who specializes in youth culture and consumerism. Learn about A Yin, a photographer who shoots iconic images of his homeland, Mongolia. Sports lovers will delight in the works of Aaron Poole, a sports photographer who is a student at the Brooks Institute. You can wander around and admire the works and you can attend lectures given by these famous people in person. Take your camera along and have a lesson on how to capture that perfect shot! The Skirball Cultural Center is our next recommended Los Angeles Museum to visit. This venue was inspired by the ancient Jewish tradition of welcoming the stranger and the iconic American democratic ideals of freedom and equality. 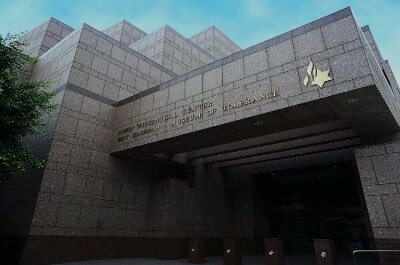 It was opened in 1996 and is today one of the world's leading Jewish cultural institutions. Come and be inspired, all people of all communities and ages are welcome. Children will be delighted by the Noah's Ark exhibition which allows them to play, explore, climb and make friends with the animals on the Ark. Live happenings and impromptu events make this a fun and interactive experience that they will never forget. Wander around and soak up the ambiance, there are exhibitions showcasing the life Paul Simon, the broken city of Aleppo and the struggle of the Jews through the ages. Then watch an outdoor movie followed by cocktails and eats. Music lovers can relax as the sun sets and enjoy a sunset concert of music, dance and singing. When you are done with arts and culture, go for something totally way-out and super cool! 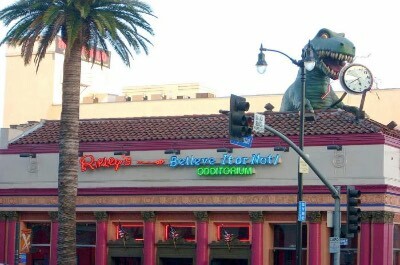 Ripley's Believe It or Not Museum will have the whole family in awe as you see the most unbelievable sights on Earth. The auditorium is called the Odditorium, so you know what you are getting into! See a robot made from scrap car parts, a work of art made from duct tape and a gruesome shrunken head. See Michael Jackson's portrait made entirely from candy and explore the Star Wars Gallery. 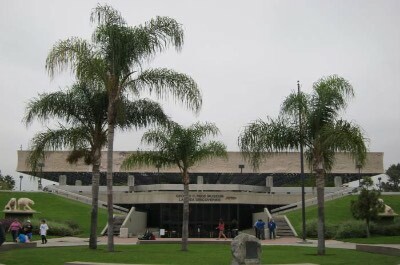 The Museum was created by Robert Ripley and today has branched out into TV shows, comic books and newspaper cartoon panels. This Museum features over 20,000 photographs, more than 100,000 cartoon panels and 30,000 artifacts. It also includes rare treasures and strange relics. Stroll around the 15 themed galleries on a self-guided, self-paced tour and decide whether you Believe it or Not! This is one of the most popular Los Angeles Museums and cannot be missed. Head off to the Los Angeles museum of Contemporary Art Grand Avenue for another spectacular cultural experience. This Grand Avenue was designed by architect Arata Isozaki in 1986 keeping classical architecture and Los Angeles popular culture in mind. Today it hosts the museum's main galleries, The Lemonade CafŽ and the MOCA Store. Stroll around and view the exhibitions, you can see the amazing Carl Andre: Sculpture as Place, 1958Ð2010, and Jonas Wood's Still Life with Two Owls, a massive painting that wraps around the outside of the building. Famous works by Andy Warhol, like Telephone and Black Iris by Franz Kline will thrill art lovers. Before you leave, visit the shop where you can buy fabulous prints, art books, a very expensive work of art or a T-shirt to show off when you get home. Exhibitions change all the time, and are relevant to today's world, so plan to return more than once! 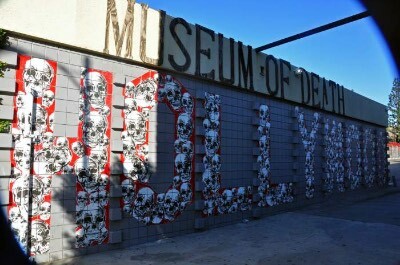 For those who delight in the bizarre and the gory, a visit to our next spine-tingling Los Angeles Museum is a must! The world famous Museum of Death was founded in 1995, on a piece of land that was San Diego's first mortuary. 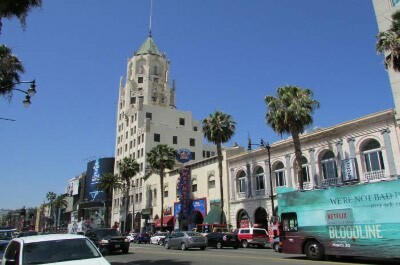 It then reopened in Hollywood, California and has become one of the most visited Museums in the world. See the world's largest collection of serial murder artwork. There are photographs of the Charles Manson crime scenes and morgue pictures of the gruesome Black Dahlia murder. Stand under authentic spooky replicas of full sized execution devices. If your nerves are strong continue on and see the guillotined head of the Blue Beard of Paris. And, how about a body bag and coffin collection? This self-guided tour is for the strong and takes about 45 minutes, but you can stay longer and indulge if you so desire! Explore the collection of autopsy instruments, learn about pet death taxidermy and see videos of cult deaths and more. Be warned that although there is no age restriction, this is suitable for adults only! For a rather sobering but equally uplifting experience, visit the Los Angeles Museum of the Holocaust, it will leave lifetime memories. The Museum prides itself on a two-part mission. The first is to commemorate those who perished and honor those who survived. The second is to further education about the Holocaust to the public, with the main focus on students from poor schools. The Museum also strives to create opportunities for dialogue with Holocaust Survivors, who embody living history. The permanent exhibition houses documents, relics, artefacts and relics from this period. Explore the Rise of Nazism, Deportation and Extermination and Life After the Liberation. Sit in the extensive library and archives and be awed at the collections of books, manuscripts and other works. Strong nerves are needed so be prepared. You will leave with new sense of how amazing the free world is and how important it is to preserve it. If you want to have a family fun day and be a star in Hollywood head off to the Hollywood Wax Museum Los Angeles. You can get up close and personal with famous movie personalities and celebrities and have photos taken in poses that you choose. You will learn all sorts of interesting titbits like what pets they have, what they hate or love, their accomplishments and failures! Try walking the Red Carpet while being hounded by paparazzi (your family and friends) and see how it feels. Relive the glamor days as you try on famous costumes - make sure you take some selfies. If you love singing, grab a mic and sing along with your favorite star. If you want scary stuff, visit the horror section and get some spine-tingling chills. Then learn how it takes seven people over three months to create one of these astounding wax figures. 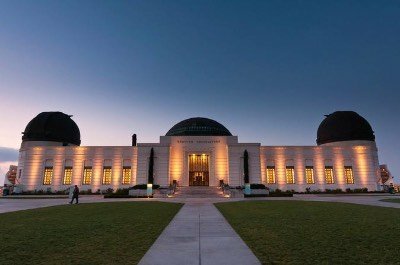 This is another one of the most popular Los Angeles Museums, it must be on your to-do list and makes a great day outing for the whole family. 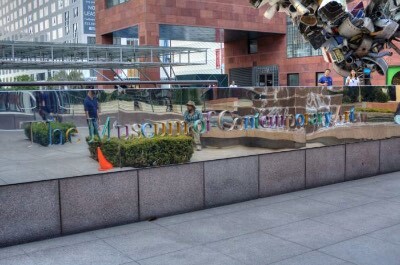 The Museum of Tolerance, is a multimedia Los Angeles museum designed to examine prejudice and racism around the world. 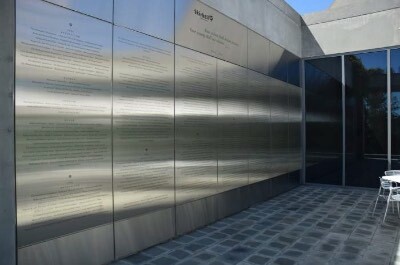 It also has a strong focus on the history of the Holocaust. The Museum opened in 1993 and soon became world renowned, especially in an era when young people were questioning whether the Holocaust really did happen. The founder, Simon Wiesenthal was dedicated to challenge these ideas and provide an experience that would change lives. Stroll around and visit the main halls feature exhibitions on the Holocaust, Anne Frank, the Tolerance Center and Finding Our Families. Specialized programs are run for businesses, educators, community services like the police and professionals. There are ever changing events that will inspire and make you want to visit again and again. Before you leave, visit the shop and buy a keepsake to take home as a reminder of this iconic venue. 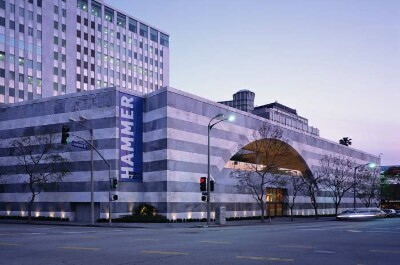 For a taste of culture and art, a visit to the Hammer Museum is a must when in Los Angeles. This Los Angeles Museum was founded in 1990 by Armand Hammer to showcase his personal collection of art works. It has since grown to become the most relevant art institution and is known for its over 300 public programs including lectures, readings, concerts and film shows. Stroll around and view the amazing permanent exhibitions. You can explore the work of Marisa Merz and Oliver Payne. Learn how copper is made and view Japanese idols and monsters. Have fun at a witty exhibition of how technology impacts on human lives. Be awed at the fact that millions of people have no access to clean water or healthy food. There is something for everyone and the temporary exhibits change all the time, making this a venue that demands more than one visit. 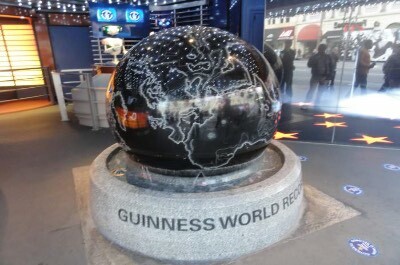 Anyone who loves reading the Guinness World Book of Records must visit the Guinness World Records Museum! Here you will see everything in real life and be astounded at the things you discover! Learn about record breaking facts, crazy and serious. See massive works of art and the tiniest sculptures. Try your hand at a long jump or check your weight against the world's heaviest person. See amazing feats like the longest chair balance on the edge of a building or the biggest California Sushi Roll. Try to eat the longest pizza and see pictures of world's oldest people. The whole family will have hours of fun and will never want to leave. Also included are amazing achievements by sporting stars, pop icons, movie stars and celebrities. This is another top Los Angeles Museum that must be on your bucket list. 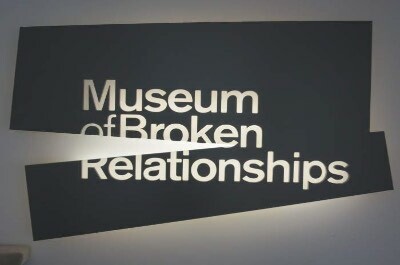 If you are one of the many people who have suffered a broken relationship, you will feel a lot better after exploring the Museum of Broken Relationships. Beautifully appointed in an elegant and meaningful way, this Los Angeles museum explores broken love and other human relationships. What they mean, what they tell us about who we are and how we learn and grow from them. Hundreds of objects have been donated anonymously by people from around the globe. Each has a story that goes with it Ð bring your tissues along! Some are sad, others uplifting and others simply amazing. Spend time and learn how other people deal with loss, heartbreak and recovery. You can donate an item too and it will become part of this amazing collection. The original idea was to offer a place for sentimental souvenirs that were too painful to keep after a breakup but which people did not want to discard. It grows from day to day! Lovers of music and entertainment must take a trip to our next recommended Los Angeles Museum, the Hollywood Bowl Museum. This Museum in Peppertree Lane was opened in 1984 and rebuilt in 1996 as a reminder of all that the region has done for the music and entertainment industry. Visit the Museum before seeing a show at the Bowl and view the exhibits of photographs, memorabilia, audio, video recordings and artifacts that tell the story of the history of the Hollywood Bowl and performances. In the Hollywood Bowl Hall of Fame, you will learn about famous people like John Williams, Garth Brooks, Stevie Wonder and Frank Sinatra. Join a tour or stroll around on your own. You can go backstage and on-stage to get a feel of this iconic venue. When the Bowl is empty, you get a real feeling of the immensity of this stage. Music lovers will be thrilled to watch a rehearsal of the famous LA Philharmonic Orchestra. When you are done, enjoy a meal and a glass of wine at the Wine Bar by a.o.c. Fascinated by all things Hollywood? Then you need to set off and spend a day at the fabulous Number One rated Hollywood Museum where you will be enchanted by the red carpet, bright lights and world of cinema. This Museum holds the world's largest collection of Hollywood memorabilia on four floors of breathtaking exhibits. Be prepared to be blown away! See hundreds of costumes including the million dollar dress worn by Marilyn Monroe and Elvis Presley's famous bathrobe. There are exhibits for iconic actors and musicians the likes of Leonardo DiCaprio, Michael Jackson and Nicole Kidman, Brad Pitt and Beyonce. Kids will be thrilled to explore Jurassic Park, Jaws, The Flintstones and Harry Potter. Mum has to make a stop at the Max Factor Makeup Rooms to see how the famous stars got their 'looks'. Then learn about the history of movie making from old black and white Charlie Chaplin pictures to today's computer driven block busters. There is so much to see at the Hollywood Museum that you will probably have to come back again and again!